The new S 350 BlueTEC which is now available from Mercedes-Benz is the most efficient and safest S-Class ever. And thanks to AdBlue® emission control it also offers one of the cleanest diesel models in the world. With combined fuel consumption of just 6.8 litres of diesel per 100 kilometres (NEDC) - corresponding to CO2 emissions of 177 grammes per kilometre - the new diesel model is eleven percent more economical than its predecessor. At the same time, the power output is up ten percent at 190 kW (258 hp) and torque is 15 percent higher at 620 Newton metres. In addition, the S 350 BlueTEC already complies with the emission levels which are planned for 2014 with the introduction of the EU 6 standard. 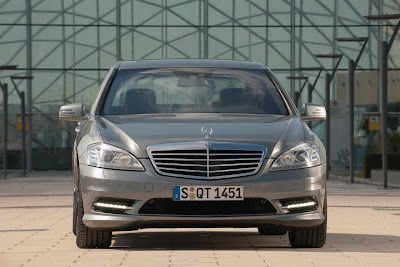 Other new features for the S-Class of model year 2010 include Active Blind Spot Assist and Active Lane Keeping Assist.